Consistency is not my middle name, at least not when it comes to Valentine’s Day. Sometimes I make cards, often I don’t. Occasionally I’ll bake up dozens of sugar cookie hearts and elaborately decorate them à la Martha Stewart with enough red food dye to make your teeth pink for days. Then the following year(s) I find I can’t be bothered to dig out my heart-shaped cookie cutters, let alone root around in the basement for my box of food dyes. I feel like I’m the poster child for a hit or miss Valentine gal. My friends are not like me. They actually plan ahead for Valentine’s Day. Hilary’s Vday imagination seems to know no bounds and each year sees her creating something more fantastic than the year before from an anatomically correct knitted heart to sculpted love token molded from the red wax covering babybel cheeses. Diane’s family celebrates with a meal of red & pink foods. The mother of one of my daughter’s friends goes to an annual Valentine card making party where dozens of people drink hot chocolate and eat fun food while chatting and crafting Vday cards like maniacs. Perhaps I need to wrangle myself an invitation to that soirée. Even Julia Child and her husband Paul sent out Valentine cards instead of Christmas greetings, well they did that because they couldn’t get it together in December, but still. Last Thursday was Mountain Day at Smith College. How do I know? Was I wandering the streets of Northampton when the bells began to ring? Did I happen to be in an apple orchard in a nearby farm which was suddenly overrun by Smithies? No, it was much more mundane. I received an email from the president informing all alumni she’d given student and faculty the day off. I didn’t give myself the day off, though I was tempted. Instead i took some time to enjoy a view of the hills from behind the town library. My own Mountain Day moment. It’s funny the things you remember about college. With our eldest daughter in her freshman year at University of New Haven I’ve been thinking about my alma mater often. Especially the quirky little food memories which have stuck with me for more than a quarter of a century. Every Thursday night Smith would serve us a family style dinner by candlelight, complete with linen napkins and tablecloths. I loved those cloth napkins and so did my mother. 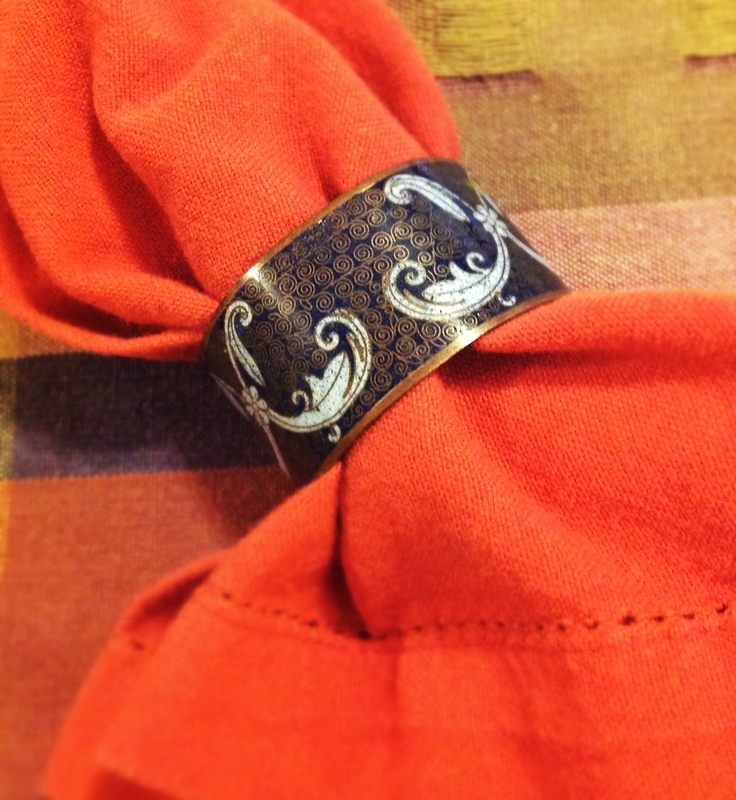 She was so entranced with the tradition she got me my very own cloisonné napkin holder. The cloth napkins took a little getting used to since unlike paper napkins where you use and dispose of them after every meal our linen napkins had to last us for a week. If it became too grubby you could put them in the napkin hamper, then use paper until the following Thursday when you got a fresh cloth napkin. We even had our own individual napkin cubbies in the dinning hall. Smith’s food was what we referred to as “grade A institutional food”. Great food considering it was made in such large quantities, but by no means home cooking. Every so often I’d go on the hunt for something that wasn’t made for 100+ students or that was rare enough to be a considered an out-of-dining-hall treat. One fall, around this time of year, one of my best friends Jim Ferguson and I were wandering around the farmer’s market in Amherst, Massachusetts. As much as I loved Smith, it was nice to occasionally get off campus and cross the river to visit Ferg and his friends at Amherst College. One booth was selling small boxes of what were probably the last of the fall raspberries. We bought two. Half a pint of heavy cream, two bowls, and two spoons later we locked ourselves in Ferg’s room. No sharing. No talking. 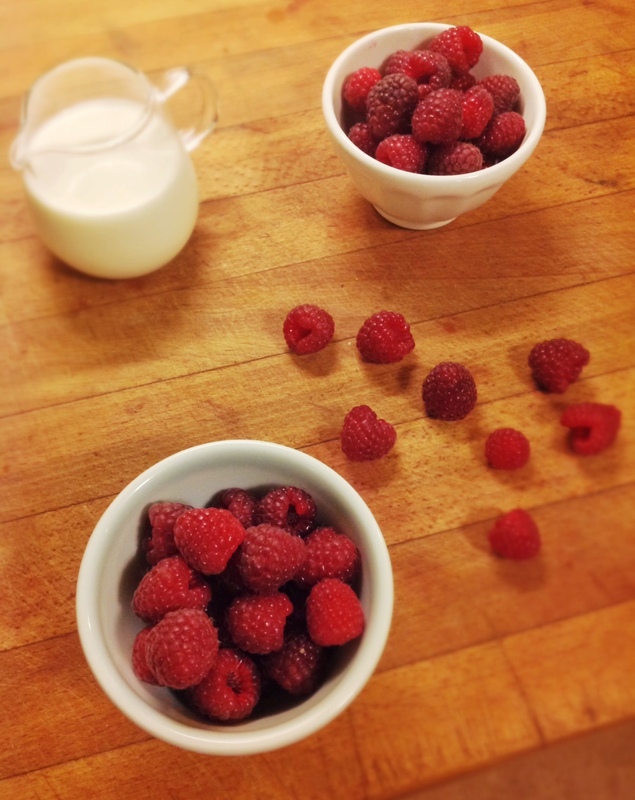 Just gobbling fresh raspberries swimming in heavy cream. One small box each. It was perfect. I’m sure many of the meals we ate were amazing, after all with Julia Child and Charlotte Turgeon as two of our illustrious alums college dining services had something to aspire to. The funny thing is it isn’t the fancy food I recall (and still eat) but the simplest. It is the humblest of desserts. Probably something thrown together when the cooks were just so tired of feeding us they wanted to weep and throw their ladles in the soup. And we loved it. We acted like a bunch of hungry sharks circling around a hurt fish. It required no cooking and no prep. Are you ready? 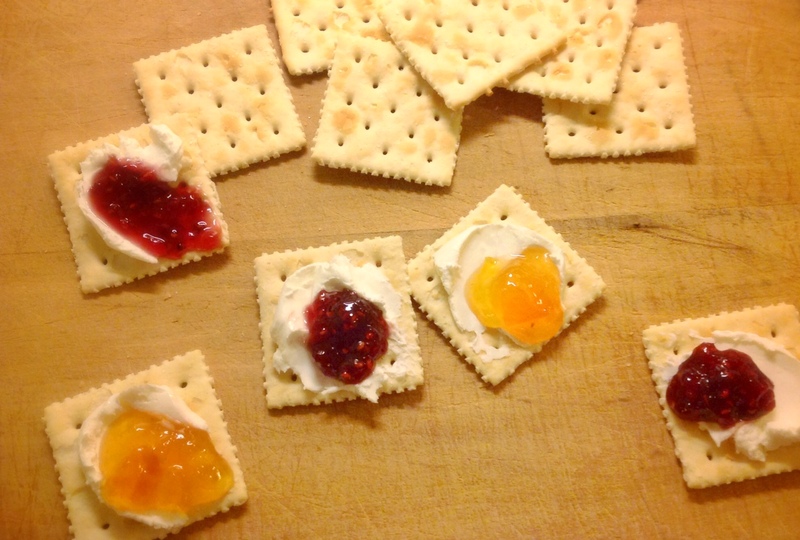 Cream cheese, Ritz Saltine crackers and jelly. If you think about it it’s almost like a deconstructed cheesecake. Don’t believe me about how good this is? I dare you to try it. What are your favorite college food memories? Today would have been Julia Child’s 100th birthday. I remember sitting on my parent’s couch when I was about twelve watching an episode of The French Chef while Julia prepared chicken kiev. I was mesmerized. Then I had to replicate the recipe, I just had to. So I boned out and pounded several chicken breasts, prepared a compound of herb butter, trussed up the chicken with its flavored butter tucked inside, crumb coated the chicken “packages”, fried till golden, and baked them so they were cooked through. The only thing Julia forgot to mention was that melted butter could squirt quite far when you sliced into your portion of chicken kiev. A butter stained shirt was a small price to pay for the thrill of being able to copy one of her recipes. Once was enough though and I haven’t made chicken kiev since then. There is however another chicken dish I have made dozens of times, which has never squirted at me, not once. Honey Mustard Chicken. 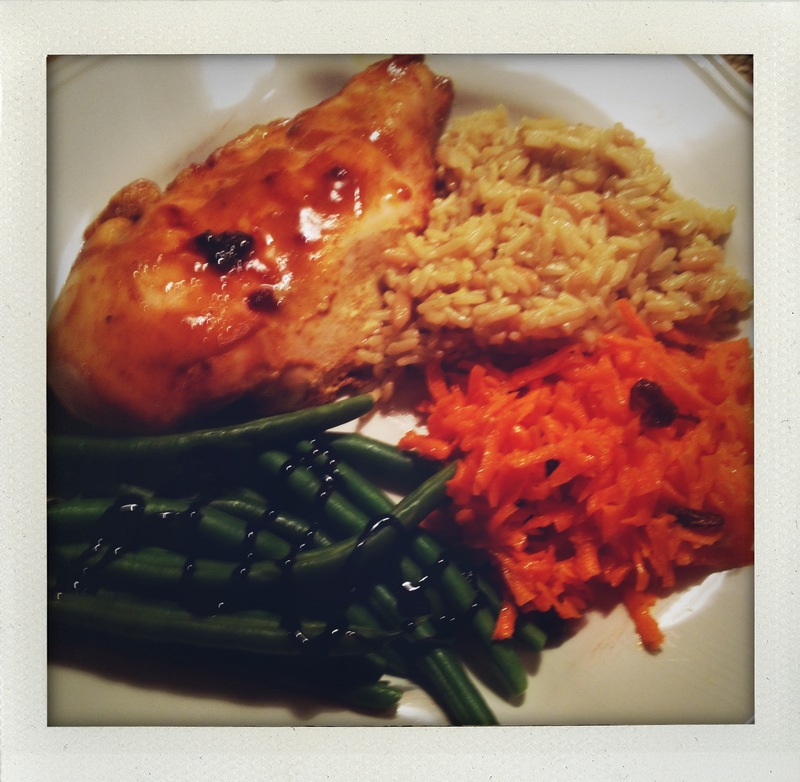 When I wrote Two Girls in Brooklyn my friend Marisa reminded me of one of our staple suppers – Honey Mustard Chicken. It was and is a dish we made over and over again. Never going out of culinary fashion, even if it is nowhere near as fashionable today as it was when we first started making it. Grainy Mustard? Curry Powder? Both were exotic kitchen items back in the early 80s. I have not idea where the original recipe idea came from. Julia has a spicy mustard chicken in her book The Way to Cook, but I think the original inspiration came from elsewhere. It actually doesn’t matter where it came from, just that Marisa and I make it to this day. Last month my daughter and I were in Boston for WordCamp (a weekend of geeking out over WordPress stuff) and decided to stay an extra day to visit colleges. Since we were staying a day more than planned we needed a place to stay. 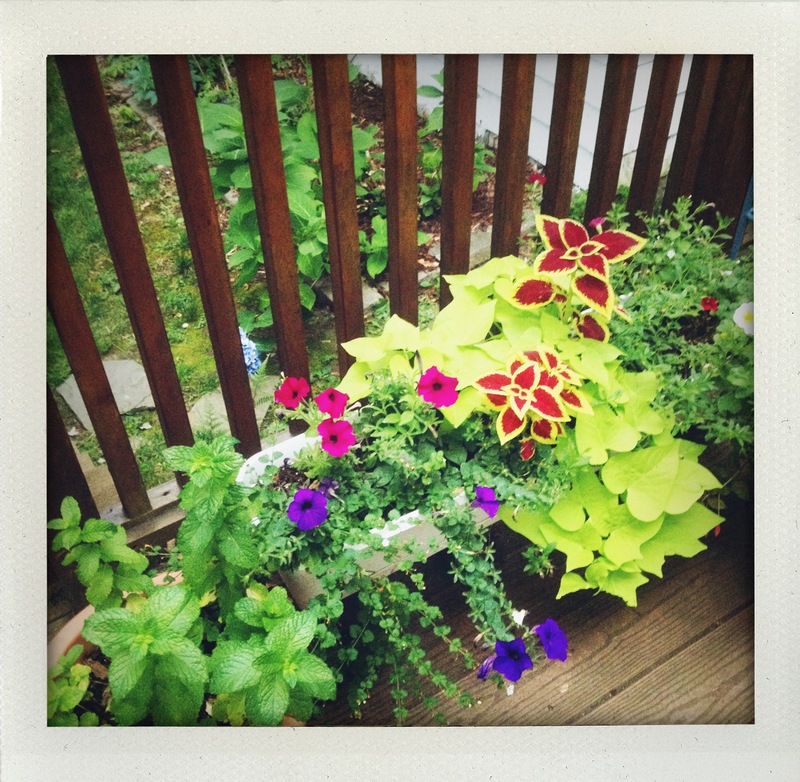 Our friend Laura B. offered her guest rooms. Delighted at not having to figure out hotel arrangements I offered to cook dinner. Something for a small gathering which wasn’t a recipe I’d already blogged about, but was a dish I could remember off the top of my head. Honey Mustard Chicken, Carrot Râpées Salad, Bill’s Sangria* and Laura’s Mixed Fruit Crumble with Ginger and Almonds. 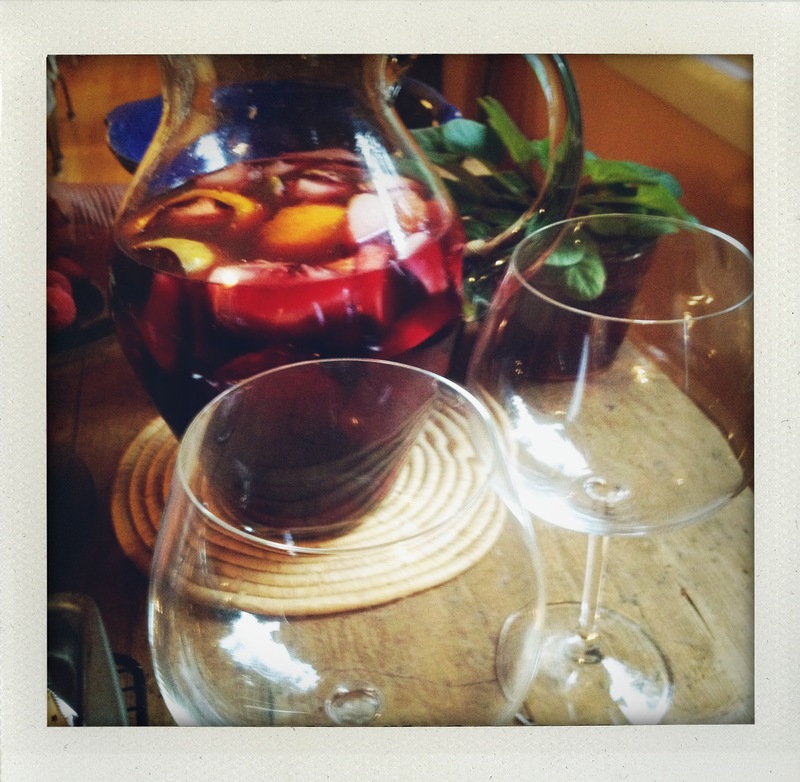 I’ll give you the sangria and carrot râpées recipes soon. In the mean time here is a recipe you should add to your recipe box NOW. Julia and I say so. Mix up the honey-mustard-curry. Slather half the mixture over the chicken breasts and cook at 400º F for 20-35 minutes depending on if the bone is in or out. Spoon the other half over the chicken and cook until the coating starts to caramelize and the chicken is done (another 15-30 minutes). 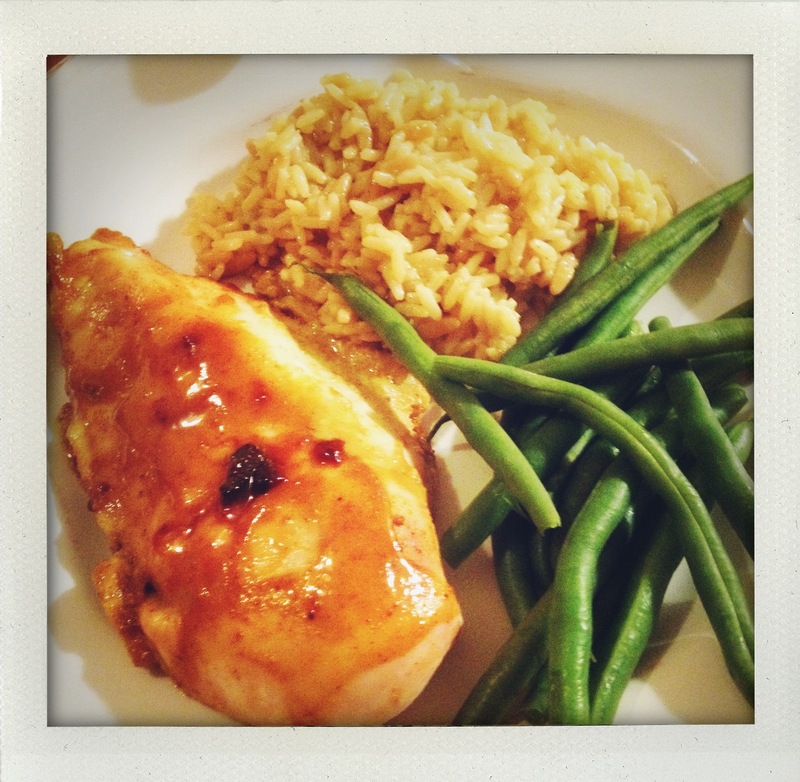 Make sure to spoon the honey mustard glaze over the chicken when you serve it. *I did text my friend Hilary for her step-father’s Sangria recipe. Fortunately she was able to send me a list of ingredients, which I’ll try to post later this week. It’s posted and you can get the recipe here. Can she make a Crêpe? I loved the movie Julie & Julia, well I loved the half of it featuring Meryl Streep as Julia Child. The other half grated, as did the book the movie was named after. 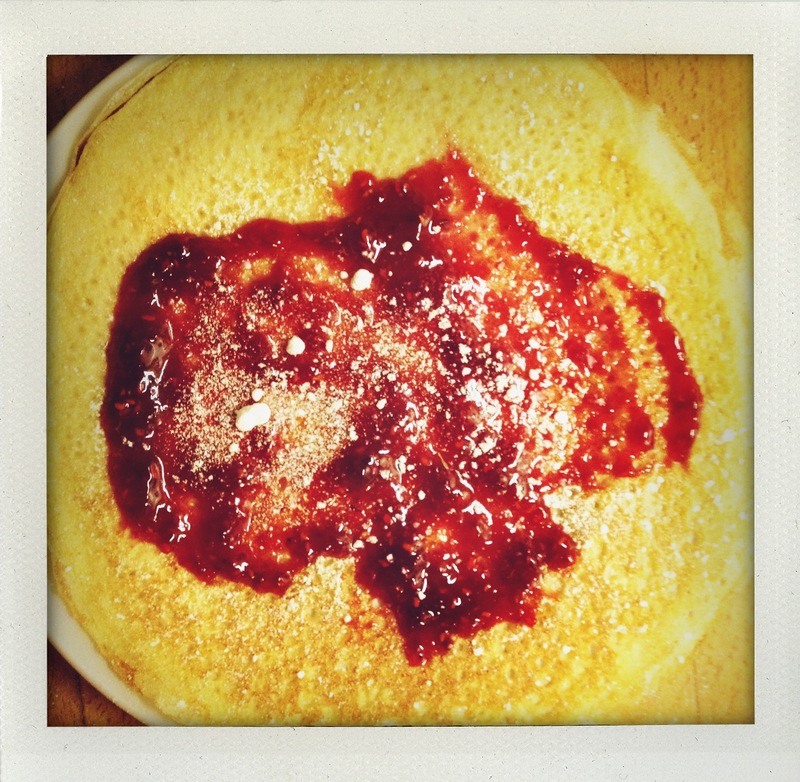 One of the things that really tweaked the cook in me was Julie Powell’s inability to consistently make a crêpe. She’s right, the first one can sometimes be a bit wonky, but after that they should sail along. Batter in, tilt the pan, cook till brown and speckled then flip. Next. 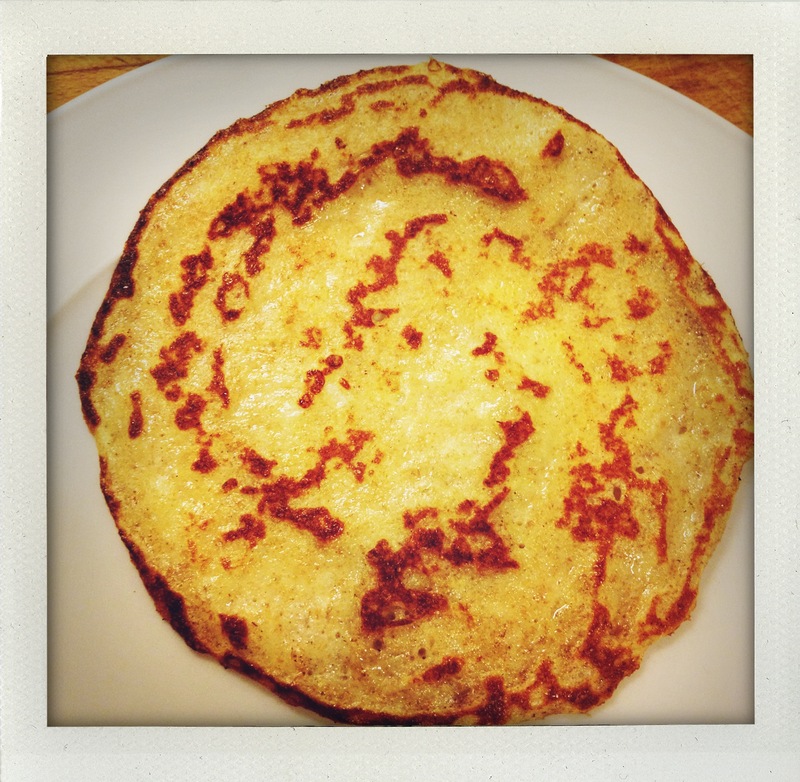 In and out of the pan, being eaten by the hungry hoards in your kitchen who line up at the first sizzle of the crêpe pan. However, Powell is hopeless with crêpes, and not only is she hopeless she whines about it. It made me want to slap her and inquire about her cooking IQ. Julia Child is a good teacher, I remember learning to make Chicken Kiev from watching Julia demo it on tv. When I was 13! We’re talking boning a chicken breast, making the herbed butter, the whole 9 yards. 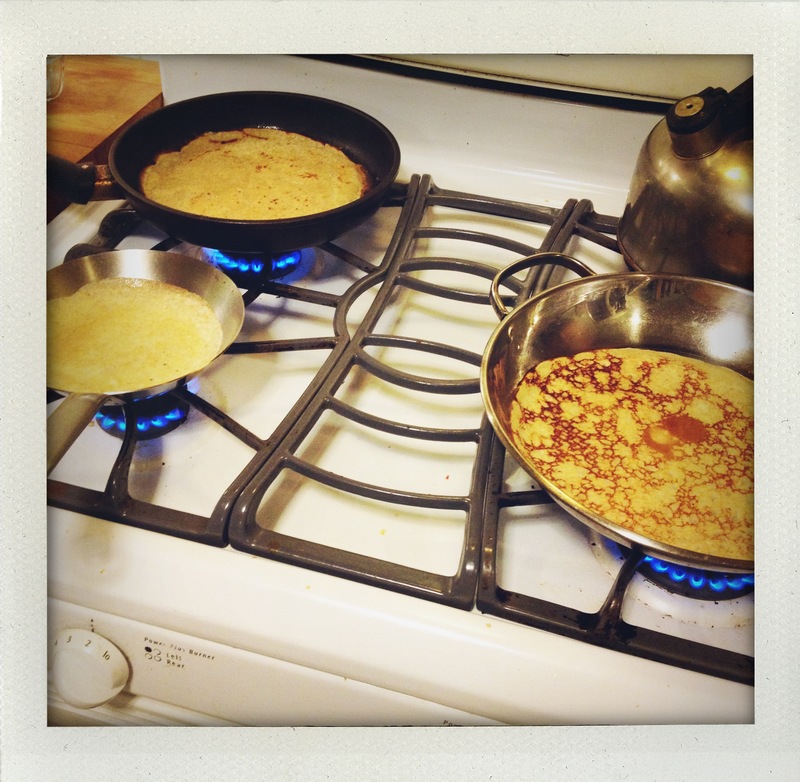 So don’t tell me crêpes are too hard because they’re not. Sorry for the rant, just had to get that off my chest. My earliest memory of eating crêpes was I first visited Paris. You could buy crêpes on the streets of Paris much the same way you can buy hot dogs and pretzels on the streets of New York. The vendors always made their crêpes with little paddles that smoothed the batter into a giant crêpe. Filled with Apricot jam, Nutella, Sugar and Lemon it was hard to choose what to have them put inside before they folded it up and wrapped it so you could stroll and munch. I don’t make my crêpes as large so I figure I don’t have to decide on one single filling I can have one small crêpe of each flavor! Whisk together milk, water, and eggs. I like to do this in a pitcher so later I can just pour the batter into the pan. Whisk in flours, salt and sugar if using. Then whisk in melted butter. The batter then needs to rest for a few hours. I experimented with several different pans to see if one worked better than another and found that the plain metal ones browned better than the non-stick pan, however all worked. The trick is to have your pan medium hot before you pour your first crêpe and swirl a small pat of butter in to get things going. Then it is simply pour, tilt the pan to swirl the batter evenly along the bottom, wait till the first side is browned and flip. I like to flip with my fingers, though that is too hot for some people. A flexible spatula works well if your fingers aren’t singe-proof. 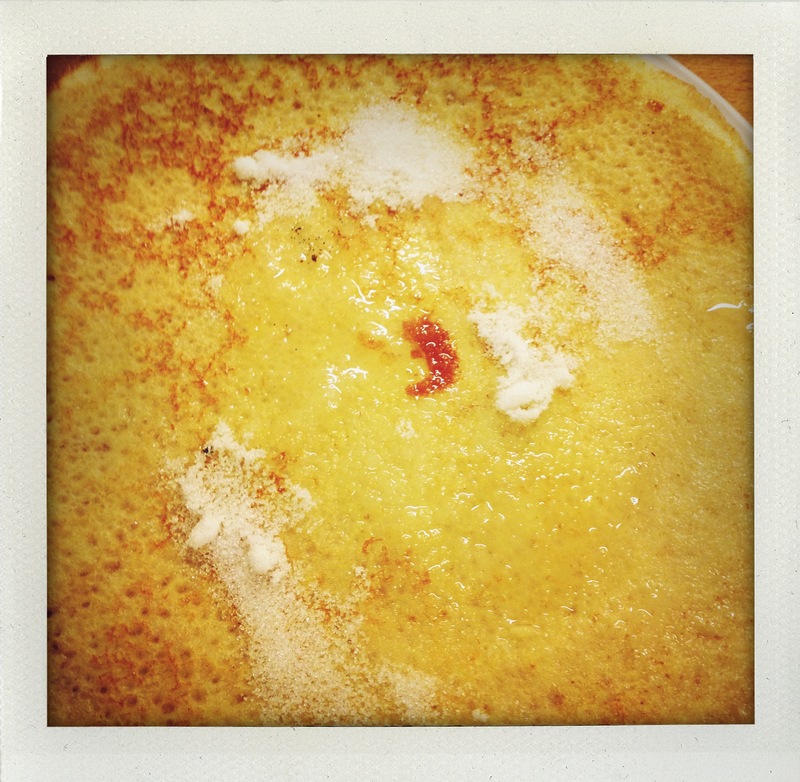 I find that after the first crêpe is cooked I don’t need to keep re-buttering the pan because I never let it cool down. If you were to shut off the burner to eat a crêpe or two you might want to add a dab more after you reheated the pan before making more crêpes. Once your crêpe is cooked it’s time to decide what to put inside. Jam is always a good choice. 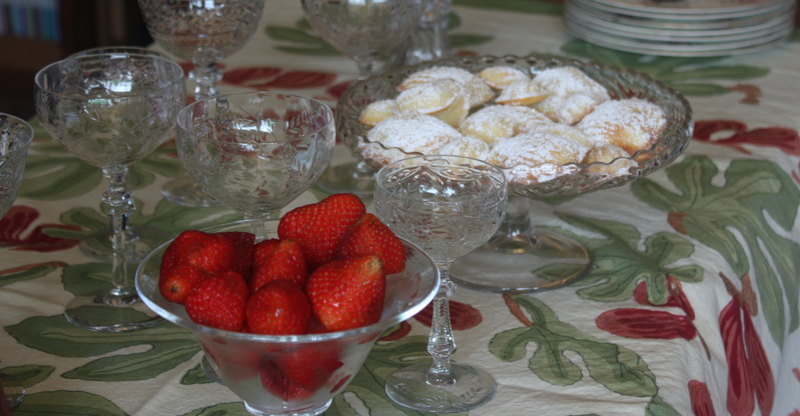 As is the classic French combination of sugar with a squeeze of lemon juice. 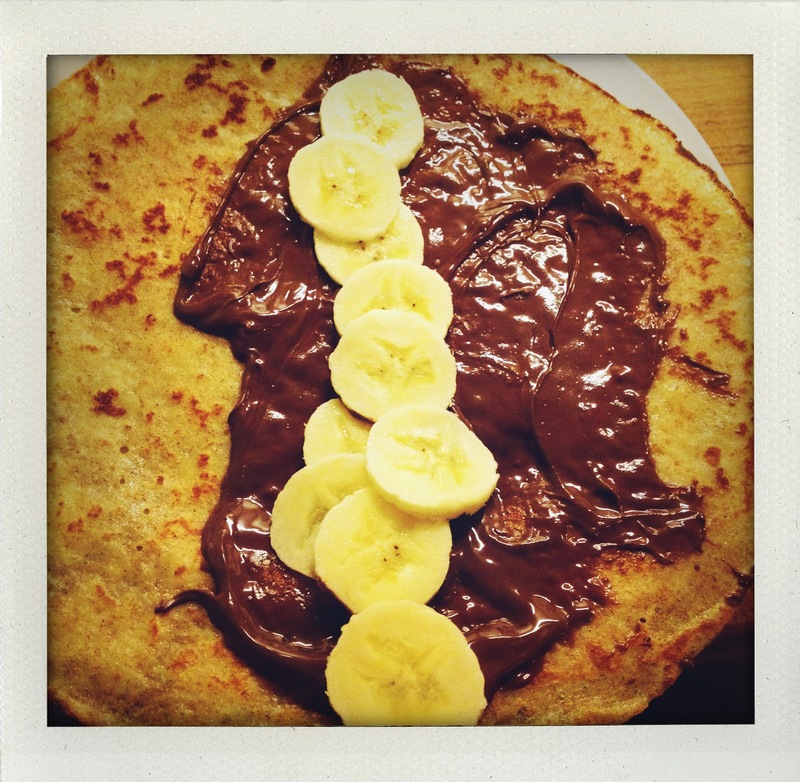 A smear of Nutella and sliced bananas is divine because the warm crêpe melts the Nutella slightly into a chocolate-hazelnut ooze. 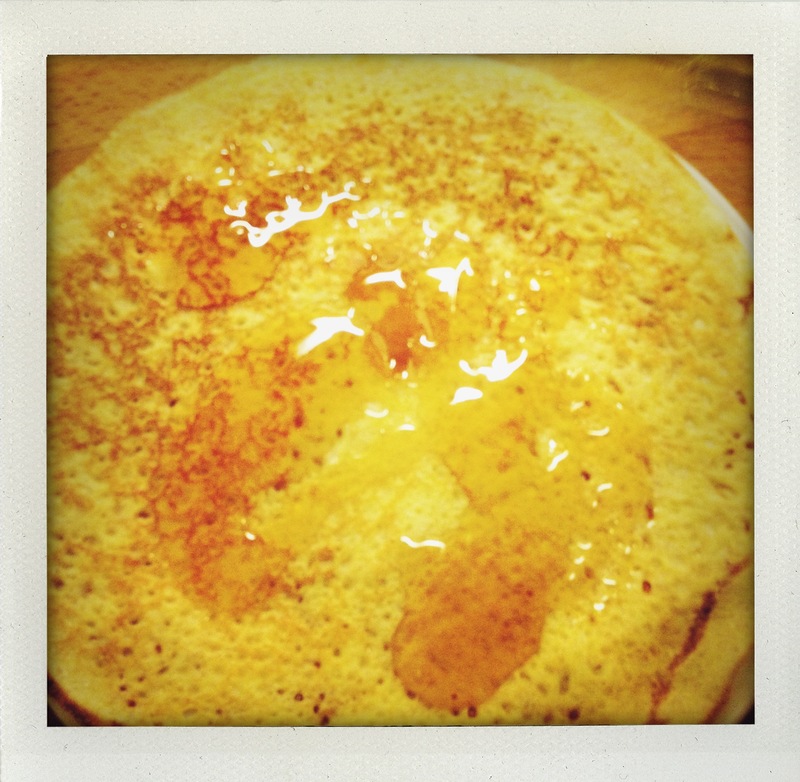 Likewise honey spreads itself when drizzled over a warm crêpe. Fresh fruit thinly sliced is good. I’ll occasionally saute some apples with a little cinnamon sugar. The choices are only limited by what’s in your kitchen. Once you’ve chosen a filling it’s simply a matter of rolling up your crêpe and eating. So what’s your favorite filling for a crêpe? I cannot claim to have had a Proustian moment with a Madeleine and cup of tea in my youth since the sad truth is I grew up in a Madeleine-less world. Somehow I managed to make it to adulthood on a diet which included snickerdoodles, sticky buns, and sour cream coffee cake but nary a nibble of the sweet cakes Proust remembered. Which goes a long way to explaining why I have become obsessed with rectifying this deficiency. 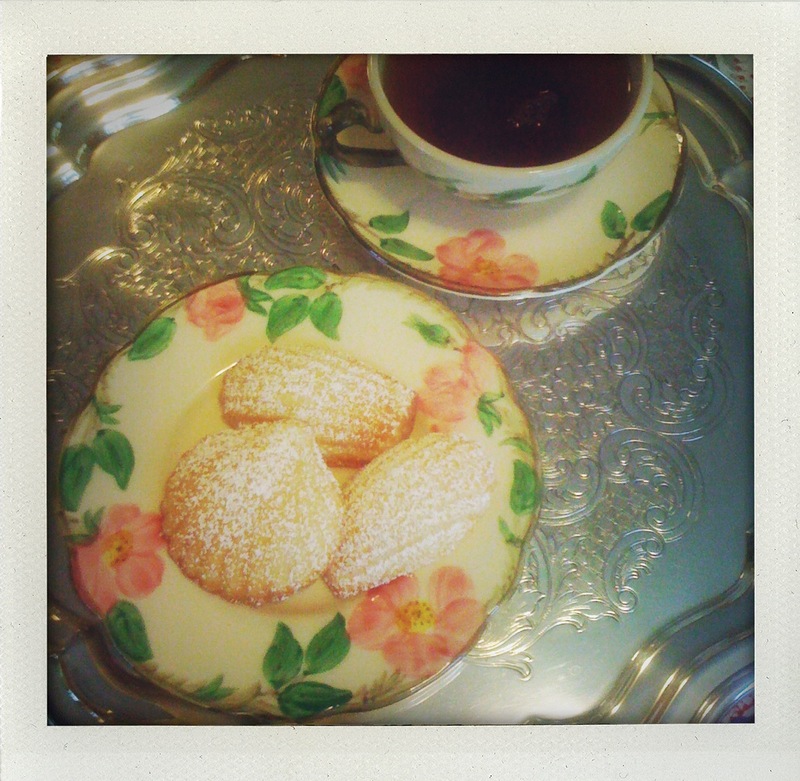 Madeleines are divine and no childhood should be without a few dozen or more (over the years, not all at once). 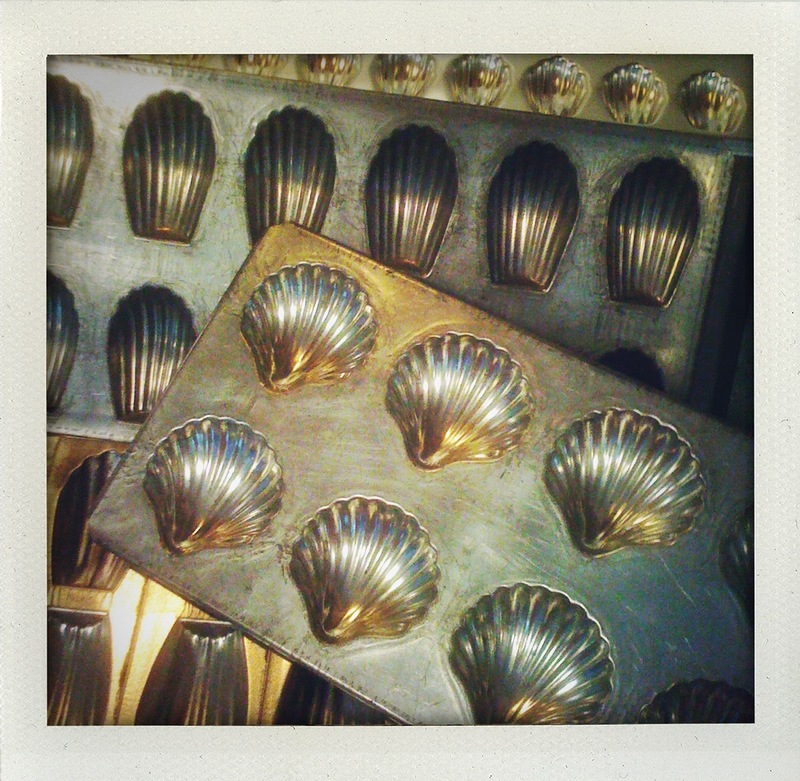 My friend Alexis, who lives in Paris, sent Shawn and I madeleine pans from France as a wedding present. Over the years I have acquired madeleine pans of all shapes and sizes am continually on the lookout for more (though I eschew the non-stick pans which the butter renders unnecessary). Next to the Best Chocolate Cake Cupcakes I find madeleines a quick, satisfying treat on the non-chocolate side of baking. It was very lucky I wasn’t eating a madeleine at that moment because I might have choked to death laughing. Yes I know I’m a rotten person to laugh at someone else’s cooking mistakes but hairy, baseball sized madeleines? You would have laughed too–admit it. The thought of these ginormous cakes in need of a haircut was amusing to say the least. Turns out she’d used an inexpensive pastry brush to butter the pans with and bristles had come out and stuck to the pan. Add to that the fact that Heather owns only one 12-madeleine pan which she used for all the batter rather than splitting it into two batches (the recipe makes 24). My advice was pragmatic – I suggested she get out her tweezers to remove the offending bristles and eat the oversized madeleines as long as they were cooked all the way through. No reason to waste a perfectly good madeleine just because it is deformed. I am happy to report that Heather now makes divine madeleines with nary a bristle in the batch. Years of madeleine taste testing has led me to a tweaked version of Julia Child’s recipe from her book Way to Cook. With recipes whose primary taste is butter my first bit of advice is buy the best butter you can afford. I always use unsalted butters though with the rise in the price of butter the brand varies depending what was on sale and how flush my pocket-book is that week. Land O’Lakes, Kerrygold, Vermont Creamery, and Plugrá are all excellent choices. I also love the taste of lemon so my version has much more lemon peel and juice in it than in Julia’s version. Preheat oven to 375º F. Melt stick butter and let cool slightly. Mix eggs and sugar together until well blended. Add the lemon zest, juice, and vanilla. Mix in the cup of flour and salt then start beating in the melted butter. It will take a few minutes for that much butter to incorporate into the batter. Do not despair just keep folding. 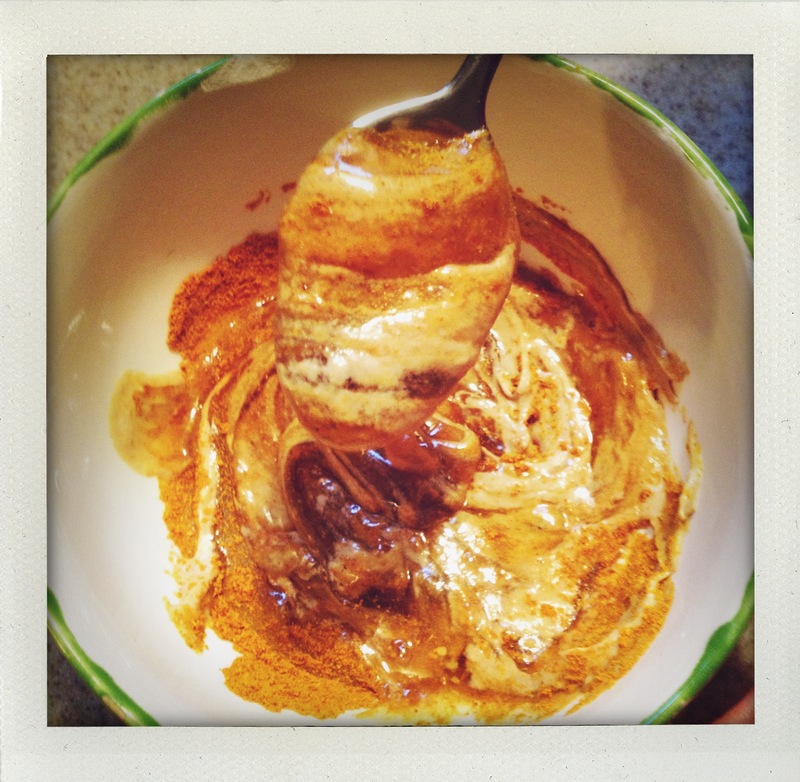 The batter will become smooth and glossy once you’ve fully incorporated it. Let the batter rest while you pop the remaining Tablespoon of butter into the butter melting pan along with the extra Tablespoon of flour and whisk them around the pan with a pastry brush (not the cheap kind that drops its bristles) until the butter is melted. 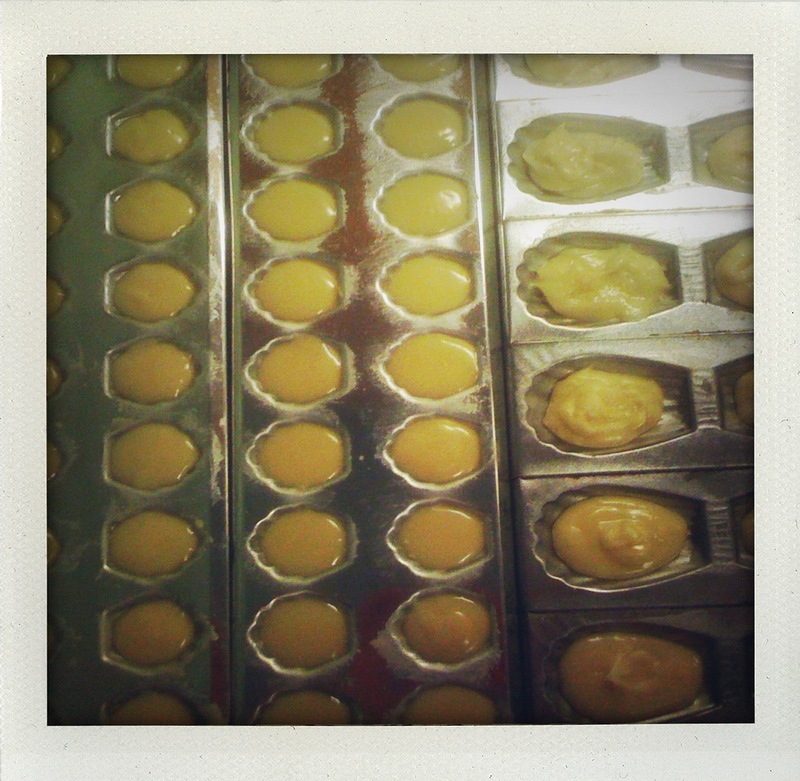 Then paint two 12 madeleine pans with the butter-flour slurry and spoon the batter evenly into the 24 spaces. 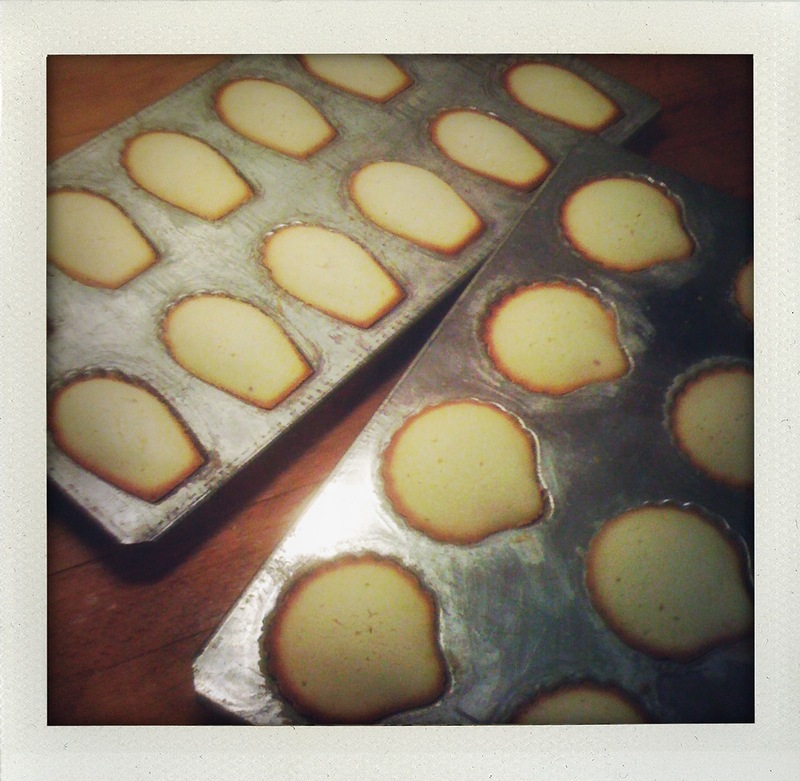 Bake 15 minutes or until the edges are browned and the centers of each madeleine have domed in the middle. When they come out of the oven give each pan a good whack on the counter or cutting board which should loosen the little cakes from their pans. Turn out onto wire racks and cool. When cool dust lightly with powdered sugar (if desired) and serve with tea or a cold glass of milk or a glass of champagne. Proust may have been wrong about the memory of how they crumbled in a cup of tea, but he wasn’t wrong to remember how fantastic these scalloped shaped little cakes are. In my opinion they don’t deserve to be dropped in a cup of tea, but rather nibbled out of hand while sipping your beverage of choice.